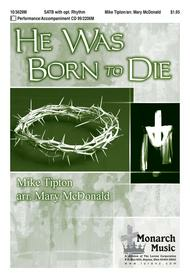 He Was Born to Die composed by Mike Tipton. Arranged by Mary Mcdonald. For SATB choir, piano (with optional rhythm). Sacred Anthem, Holy Week, Lent. Octavo. Published by Monarch Music (LO.10-3629M).This powerful ballad journeys from Christ's peaceful birth to his fateful death on the cross through expressive vocal lines and a strong, thematic chorus.